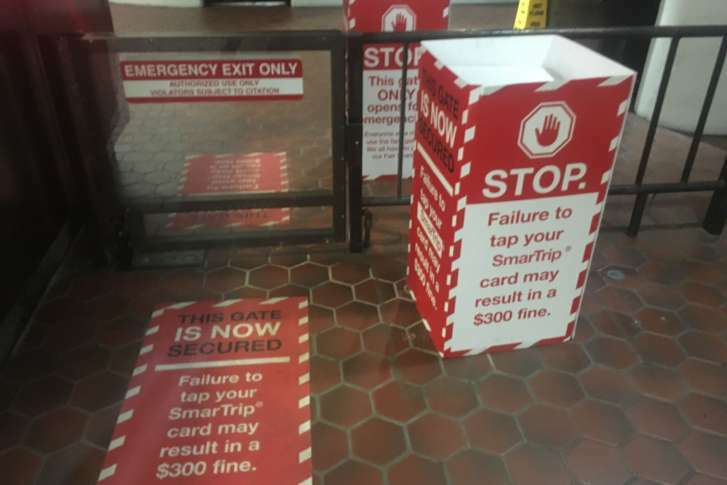 Metro is looking to crackdown on fare evaders by expanding its Fair Share program to 20 more stations in Maryland, Virginia and the District. WASHINGTON — Metro is expanding its Fair Share program meant to deter fare evaders. WMATA started testing new locking systems at emergency swing gates at the Fort Totten and Gallery Place Metro Stations on May 1. Since then, Metro Chief Operations Officer Joe Leader told the WMATA Board it had seen a 91 percent increase in compliance. Leader said 20 more stations in Maryland, Virginia and the District will join the Fair Share program, but did not give specific names. Video shows the difference clearly. Before the gates were installed, many people could be seen just walking through the swing gates with little hindrance. While many appeared to pull out their passes, there were others who slipped through when no one was looking. Since the gates were installed, no one was able to get through and eventually they went through fare gate. Leader said that in the past, students would use passes to get onto the Metro system. But that has been eliminated like paper fare cards. Now, students should be tapping their DC One Cards when they go through the gates. Greater enforcement is one area Metro says it can recoup money that is being lost to evaders, though officials aren’t sure how much is lost due to fare evaders. This also allows Metro to get a more accurate headcount of who is actually using the system so it can adjust staff and equipment to better serve riders. Leader also pointed out that fare evasions are the top cause of conflicts between users and workers, which sometimes become violent.